The spring air is crisp this April morning. The little boy and his grandma are walking, hand in hand, to the park, as they do each day. The two of them are a familiar sight in this small Midwest town. Never in any hurry, the little boy and his grandma walked slowly, taking in all the sights and sounds of the morning. Grandma lives at the little boy’s house with his parents and his younger sister. He isn’t sure why his grandma lives with them; he’s just glad she does. Some day he’ll realize that his grandma had been divorced, and she came to stay at her daughter’s house. But all these facts of life will catch up with the little boy soon enough. For now, he has this spring day and his grandma, and that is all he needs to know. I think the rest of this story is best told by the little boy. My name is Butch. I’m seven years old, but I’ll be eight soon. And this is my grandma. I would introduce her by name, but I’m not sure what her name is. I just call her my grandma. Grandma lives at my house, and that makes me happy, because I get to see her all the time. There aren’t enough beds at our house for everyone, so my grandma and I get to share a bed. I like sleeping with my grandma, and I think she likes sleeping with me. My grandma tells me stories while I’m falling asleep. Sometimes we start laughing and mom tells us to quiet down and get to sleep, but that make us giggle even more. Grandma and I act like two kids sometimes, and we both get into trouble. I never thought grandmas got into trouble. One night, I was sleeping and I wet on grandma, but she didn’t get mad. She just said I should be a fire truck when I grow up. My grandma sure can be silly. Today, we’re walking to the park, like we do every day. The park is clear across town and it takes us awhile to get there, but we’re never in a hurry. I don’t know how old grandma is, but she’s older than my mom and my dad. I think old is okay for a grandma. Did I say what she looks like? Well, she has lots of wrinkles in her face, but I think she’s pretty. Her hair is white, and it’s pulled to the back of her head, where there’s a knot and a brown comb in it. Grandma’s hands are wrinkled like her face, but her hands feel soft and warm when she holds my hand. She wears a long black coat and a hat when the air is cool, like it is this morning. The coat has big buttons on it and a furry collar, like a small animal is wrapped around her neck sleeping. Her hat is black, like her coat, and has some black lace with small flowers on it. She has a worn out coin purse in her pocket with a rosary in it and something she calls a skeleton key. Sometimes, I ask her to show them to me and I think she likes to do that. Grandma’s shoes are brown with brown laces. She probably needs a new pair of shoes from the looks of them. Grandma wears brown stockings on her legs and sometimes they look like they’re falling down. Grandma’s voice is soft. I like hearing her voice, though I don’t always understand everything she tells me, but I pretend I do, and that makes my grandma feel good. Her smile warms me inside, like summer sunshine. Grandma walks slowly, but I think she does it on purpose, so I can keep up. I’m not very tall, and my legs are kind of short. Grandma is tall and walking next to her is like walking next to a big tree, with one of its branches reaching down to hold my hand. I feel safe in the shadow of my tree; I mean my grandma. Grandma has kind eyes. She looks at me and I can see her eyes smile. I know my grandma loves me because I see it in her eyes. Grandma holds my hand tightly while we walk through downtown, like we’re doing now. Just a few more blocks and we’ll be at the swinging bridge. It’s a bridge that crosses over the river to the park. If you jump up and down in the middle of the bridge, it starts to swing a lot. I don’t think grandma likes too much swinging, so I usually don’t jump on the bridge, but sometimes I forget. That’s when grandma lets go of my hand and hangs on to the side of the bridge with both of hers. She sure gets nervous sometimes. We’re at the park now, so grandma can rest and I can play. She looks tired today. She sits and enjoys all the spring flowers that are growing in the park, and she always keeps a close eye on me. I watch my grandma while I am playing to make sure she is okay and to know that she is still there. She’s the best grandma I could ever have. The day at the park for grandma and the little boy will soon be over. He will have so much to remember, yet so much will be forgotten. His grandma passed away three years later, while he was at school. He cried and cried for his grandma, and his heart ached, for a wonderful part of his life had come to an end. But, he will always know that once upon a warm spring day, with the flowers blooming and the birds singing the joy in his heart, he walked to the park with his grandma, and she loved him, and he loved her. Today, I have the coin purse my grandma carried, and I often look at the big button that was on her coat, her rosary and the skeleton key. I remember the touch of her hand and the smile in her eyes. I still walk to the park with my grandma, in the back roads of my mind, where it is always spring. I remember my grandma, and smile, as a tear silently makes its way down my face. A tear that says, “I love you Grandma”. I loved your ‘little boy’ interpretation of your memories. What a special time for you and your Grandma, you were both given a gift. 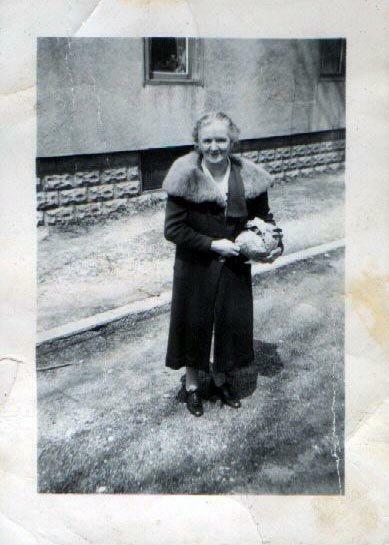 Gosh your Grandma and mine were quite alike…right down to that coin purse with the rosary beads. Time is such a stealthy thief! Where did those years fade to? Tears on my face. Lovely, lovely memories. Wonderful, LeRoy. You have brought a smile and a tender ache of loss today with your words. I miss my Gramma so much. I know she is with her Savior, and am waiting for the day when I can look into her shining eyes again. Thanks for sharing this. Tender! Yes, Grandmas are special…I know.